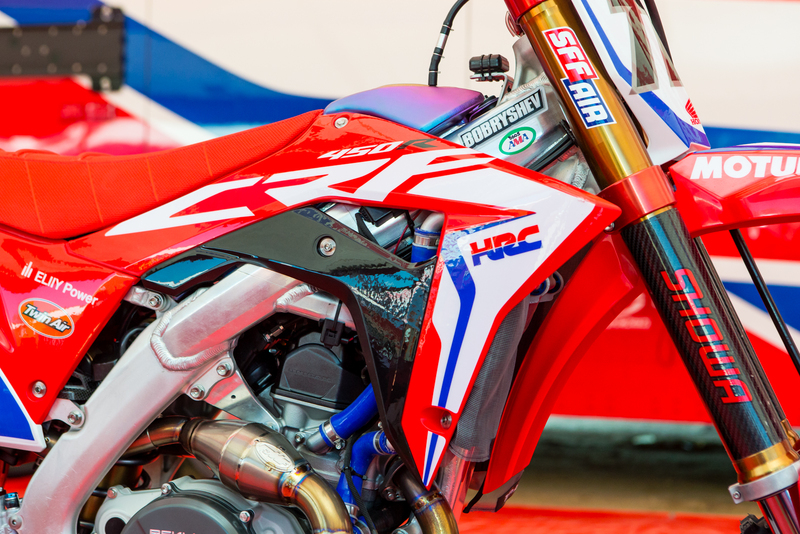 Evgeny Bobryshev's 2017 HRC Honda CRF450RW was easily the bike in the pits with the most attention around it. With frame numbers 002 and 004, it's almost literally first ones in existence. 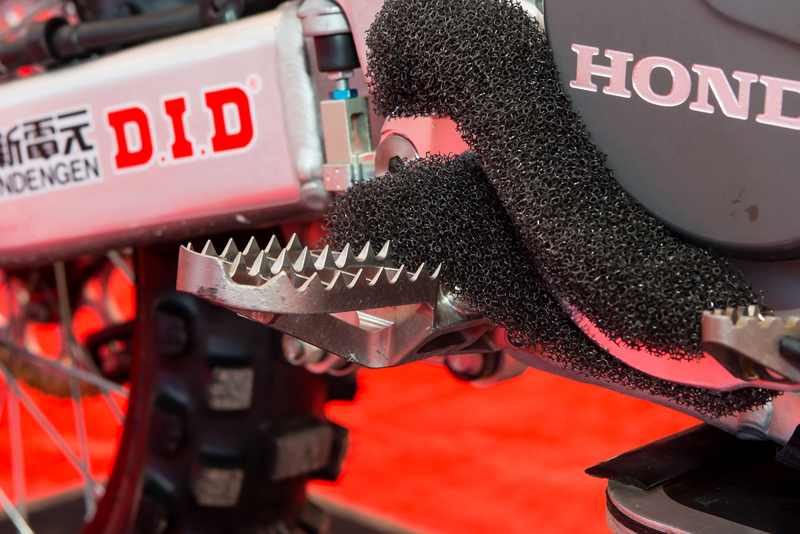 We had a good amount of time to walk around the new bike thanks to the HRC Honda squad, which got some up close shots of the bike in race trim. This little fuel tank adjacent mount holds onto their GPS sensor. Right above it you can see the extra work that goes into these bikes, with the wire-tie going from the top triple clamp nut to the stem nut. Then, it's wrapped in clear silicone hose to protect the clamps from wear, along with a small clear sheet of laminate material to protect the clamps even further. Cut into the bar pads is some hiding space for a few buttons. The one on the right is a map switch, to select between map one and two. 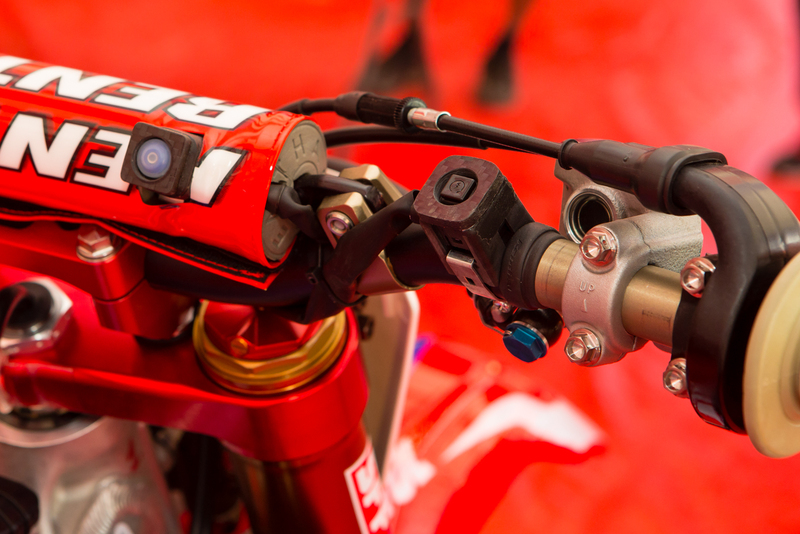 The one on the right is normally the map switch on a stock CRF450R, but has been repurposed as a launch control button. Over on the far left is the standard kill switch and diagnostic light. On the far right, encased with a carbon fiber guard, is the "magic" button. Aka, the electric start. 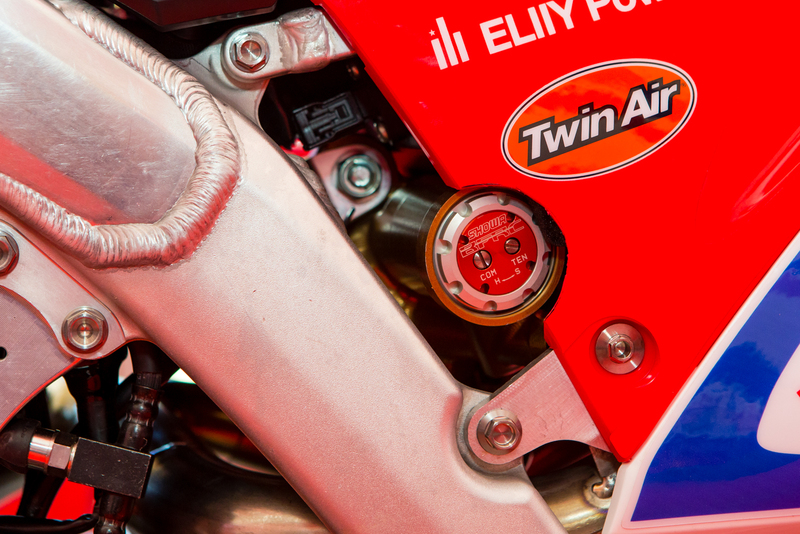 Yup, electric start ONLY for the HRC race bikes. 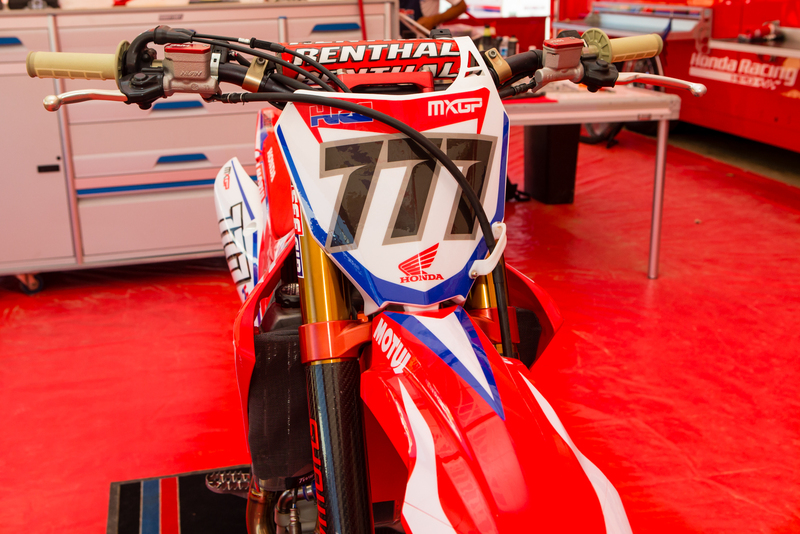 We expect this same setup for the US team with Cole Seely and Ken Roczen for 2017. 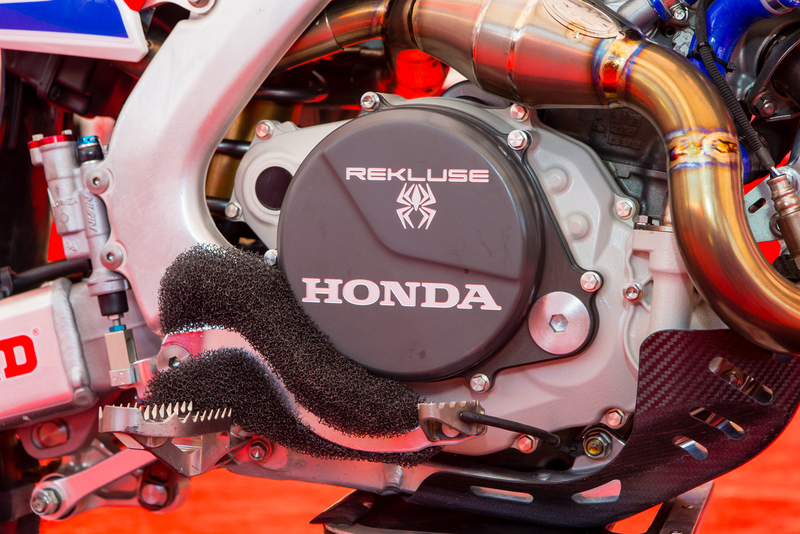 Rekluse has been working with HRC Honda Japan on their race bikes for two seasons now, meaning they had early access to Akira Narita's prototype race bike. 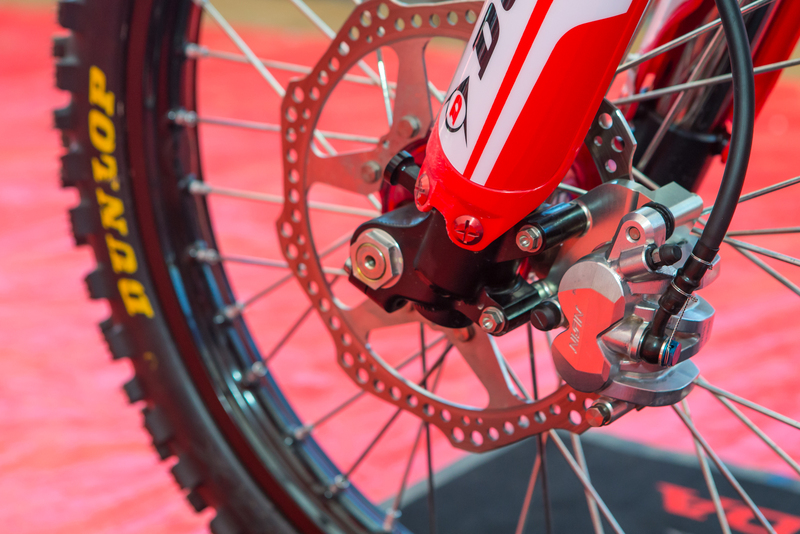 With that info, they had a complete Torq Drive clutch ready-to-go for Bobryshev's ride. 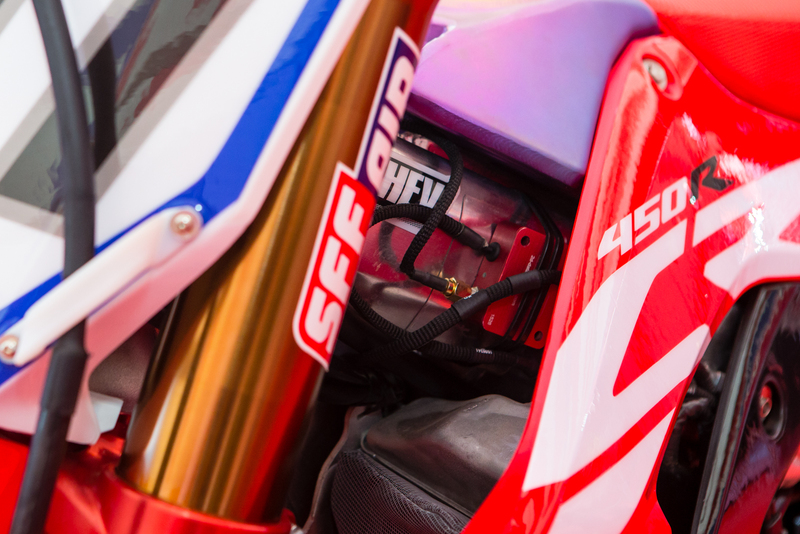 FMF is on its first season as the exhaust supplier for the HRC Honda MXGP team, meaning they also got a head start on development for the new ride. Instantly, it's pretty obvious that their headpipe drops down and has more length than the stock unit we've seen. With FMF F4.1 RCT dual carbon fiber/titanium cans out back. ...That's not the case with their race bikes. 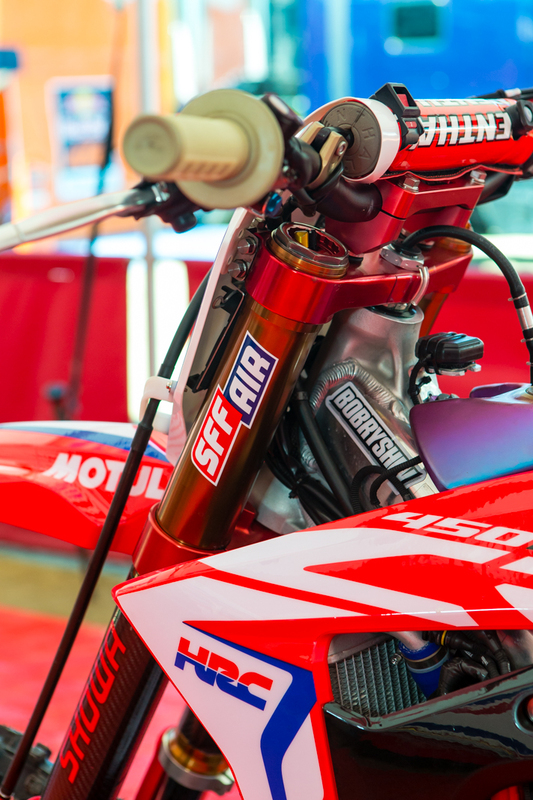 This one continues on with Showa's SFF TAC air forks, while we wouldn't be surprised to see both Cole Seely and Ken Roczen's US version utilize KYB's PSF1 forks. 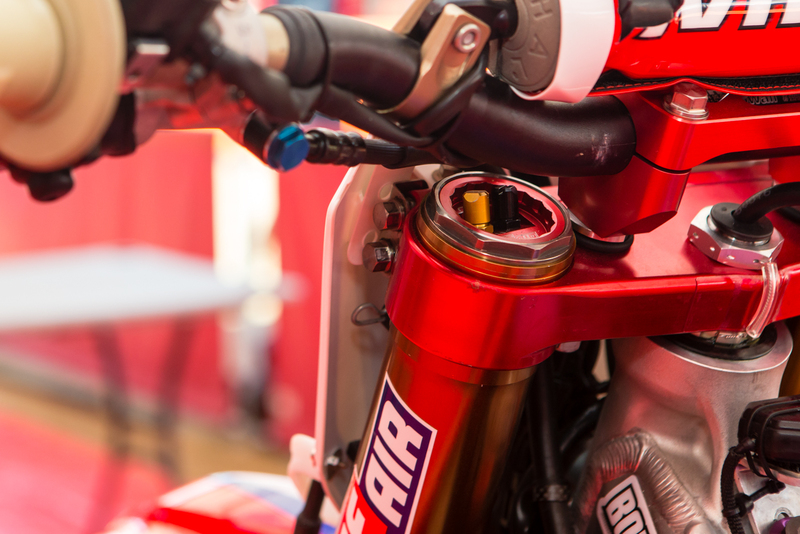 Down below are some beefy and wide axle brackets, with an under mounted pinch bolt pattern, which Showa has had on HRC Honda's forks for over ten years. 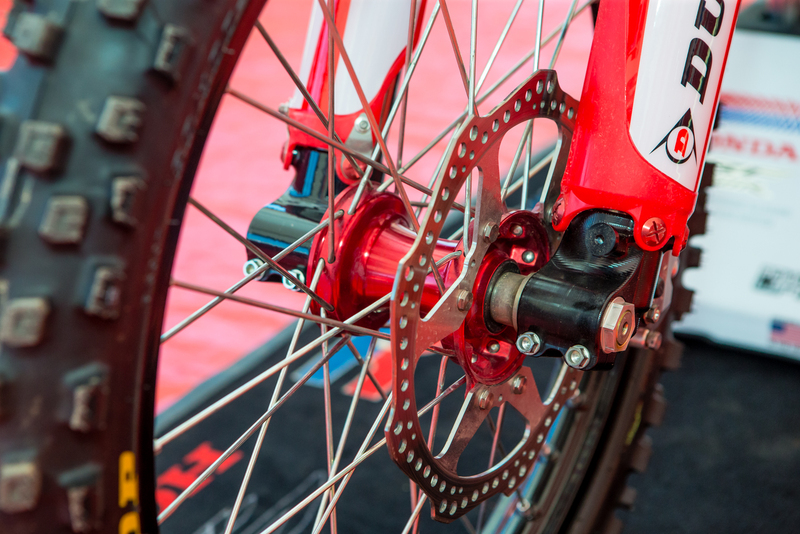 Like many works forks, these ones feature relatively small and close together brake hanger mounts. This is meant to keep the very expensive lugs safer during impact, as the brake hanger mount is much cheaper/easier to replace and can have more give when force is applied. How about the shock layout? 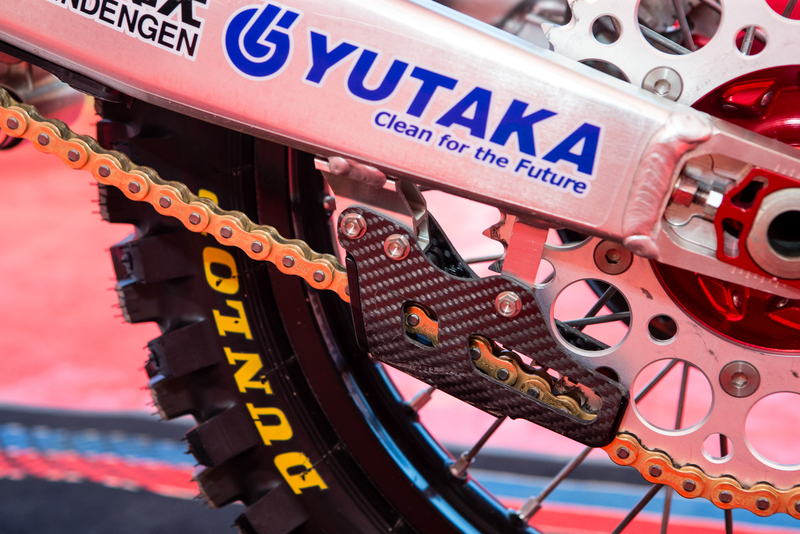 This bike is utilizing Showa's BFRC (Balance Free Rear-Cushion) which comes from the road race world. 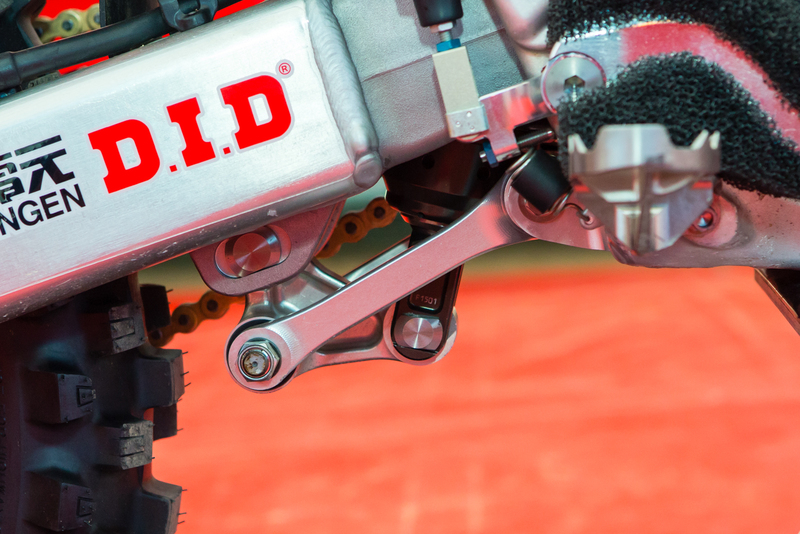 Instead of having valving on the shaft piston, it has a piston that acts as a plunger, pushing oil into and pulling it out of the large adjuster which handles the damping forces. 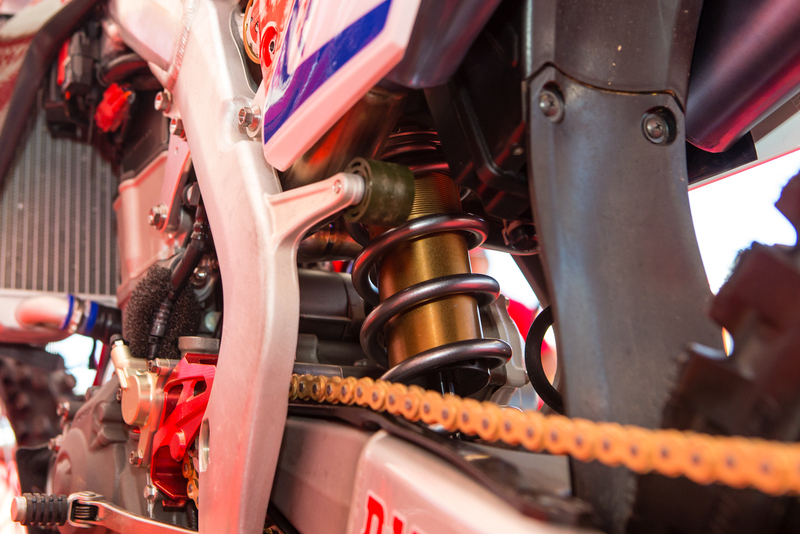 These shocks are much more common amongst the GP teams due to their characteristics, which from what we've heard is more supple initially and has a more active rebound feel. 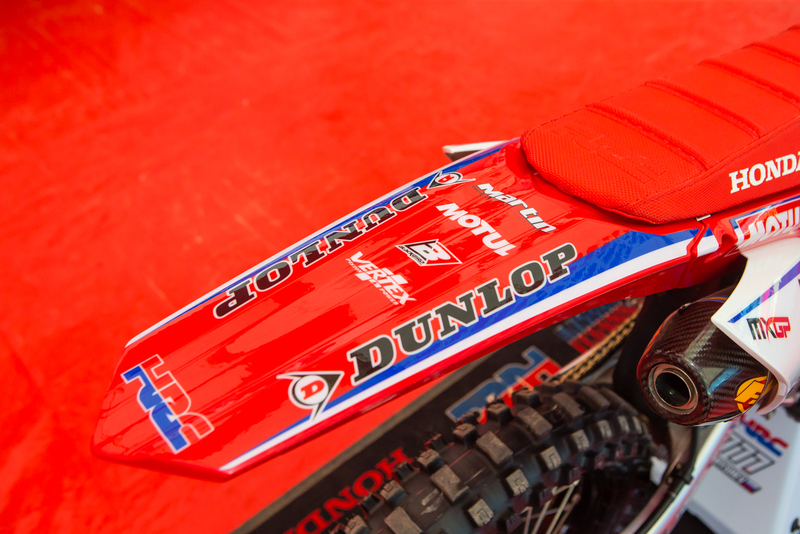 Which would work great on the choppier terrain found over two days of racing on most GP circuits but doesn't suit the fast, deeper ruts or mostly the Supercross feel that riders in the US prefer. 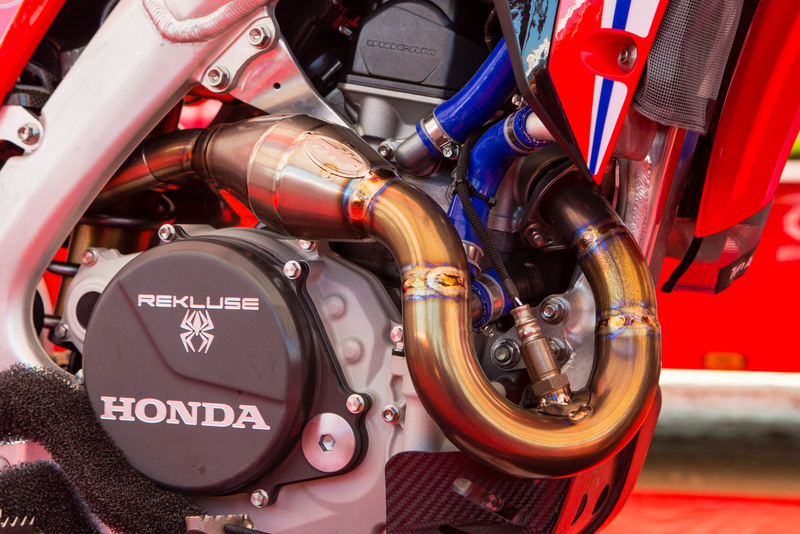 Because of the exhaust and airbox layout, things get interesting for usable room. With the shock adjuster coming out the right side, we can spot the bladder laying on its side on the left side of the bike, but covered. 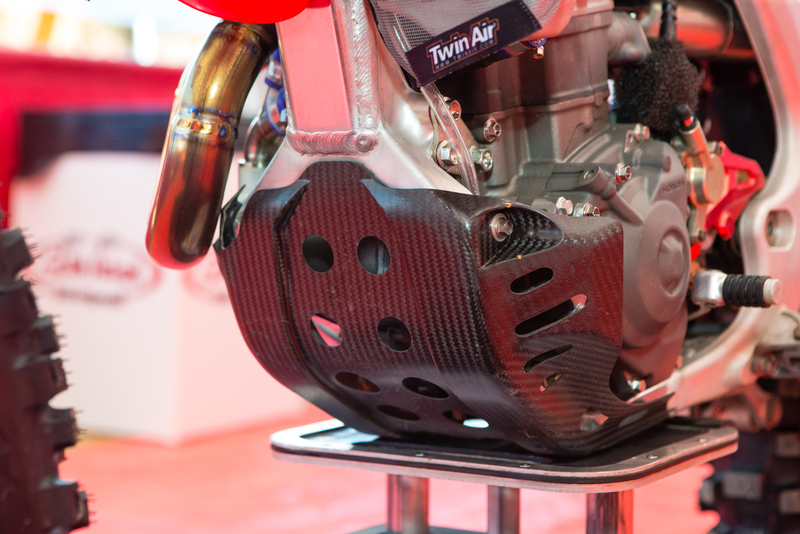 The carbon fiber you're seeing is part of the battery tray, which reaches up into the airbox and holds a lightweight battery to power the electric starter. 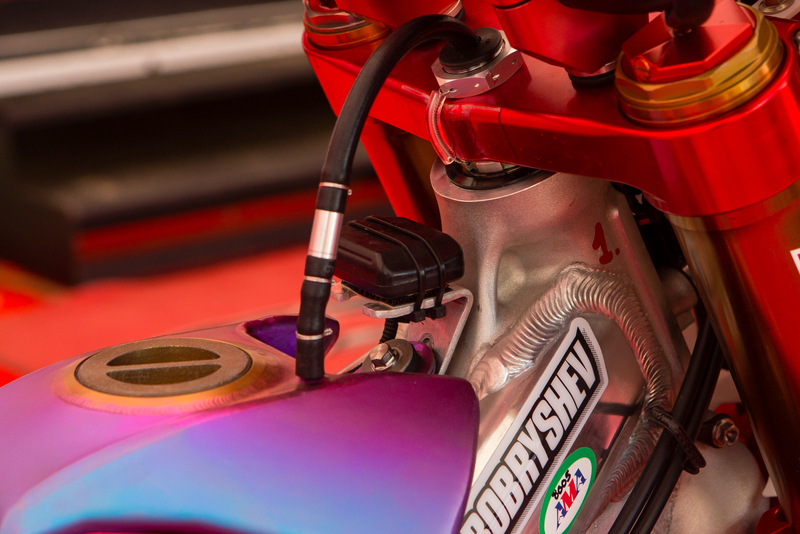 With the airbox being above the shock, it's been moved down the bike and the angle changed. 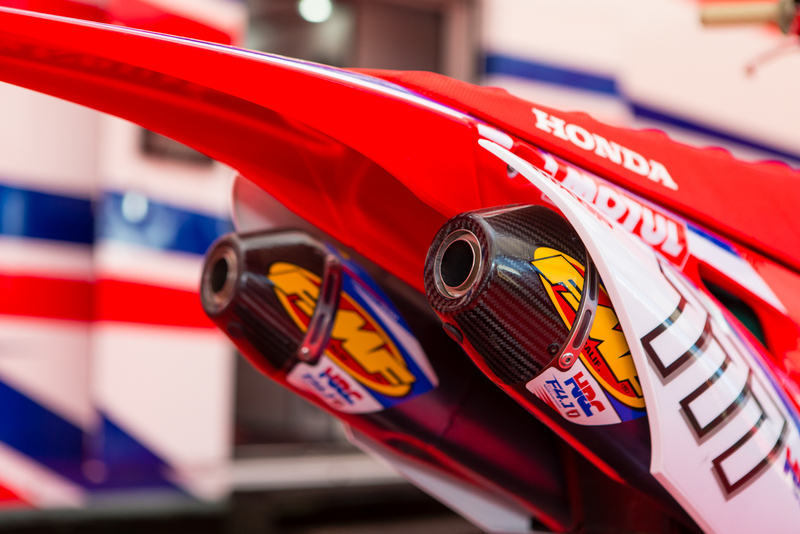 Also, the exhaust splits before the shock, instead of after it on previous models. 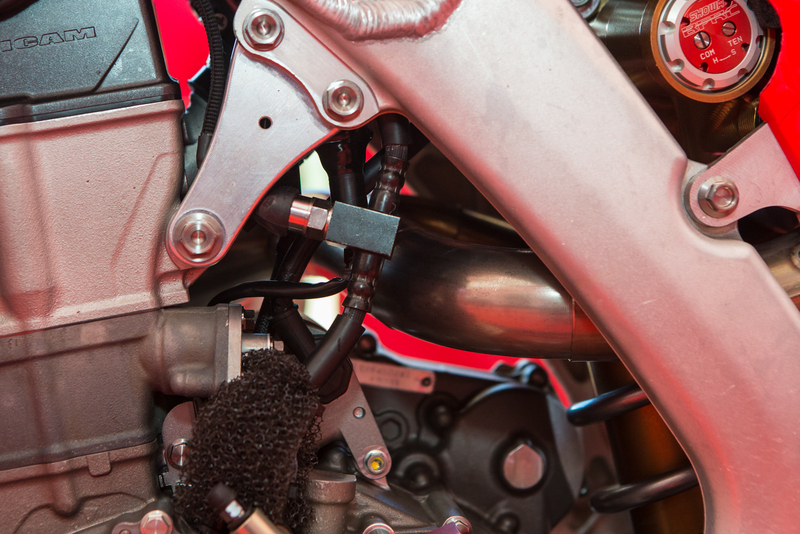 ...But when the bike is fully laid over, you can see the linkage is split into two separate link arms, to allow for more shock angle to fit in the new chassis. Check out the zoomed in shot below. Thanks to GuyB for snagging this shot in action. Moving back up the bike a bit, we can see the exhaust split before the shock. The steep intake tract is hidden behind the engine mount, also the black line and junction box behind the engine hangar is interesting. It's actually the hydraulic line running to the clutch slave cylinder, and the junction appears to be a sensor tracking clutch usage. 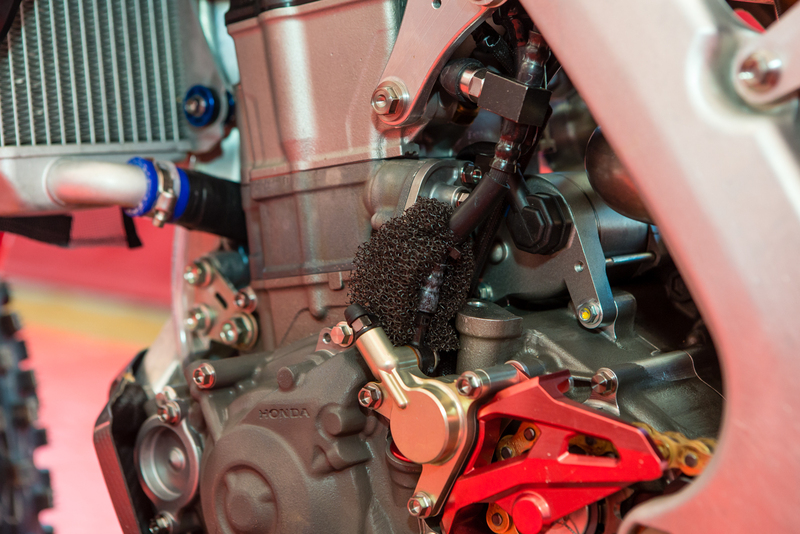 Yes, the HRC CRF450RW does feature a hydraulic clutch, as their MXGP race bikes have for a few seasons now. You can see that the area the cable clutch actuation arm would go into hasn't even been machined or drilled out on this case at all. 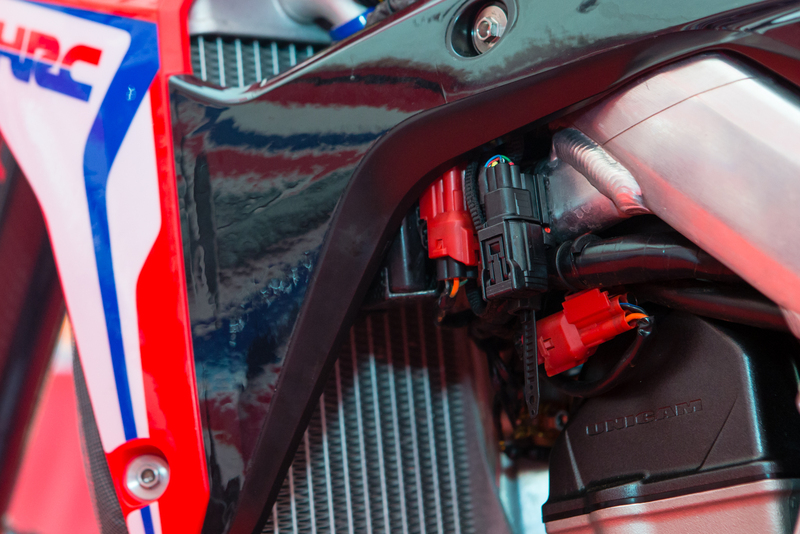 Also, on the back of the engine case you can get a clear look at the electric starter, the same one that you can buy for the 17 CRF450R separately or that comes on the CRF450RX in stock trim. Lots of plugins, including a covered one to access all kinds of data. Which needs a place to be stored. 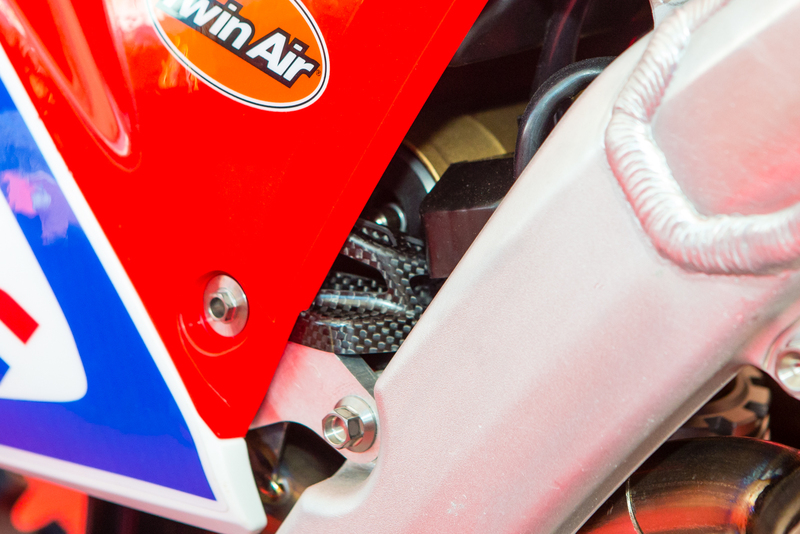 A good view of the new front fender and front number plate, along with the factory Nissin front brake master cylinder and hydraulic clutch master cylinder. 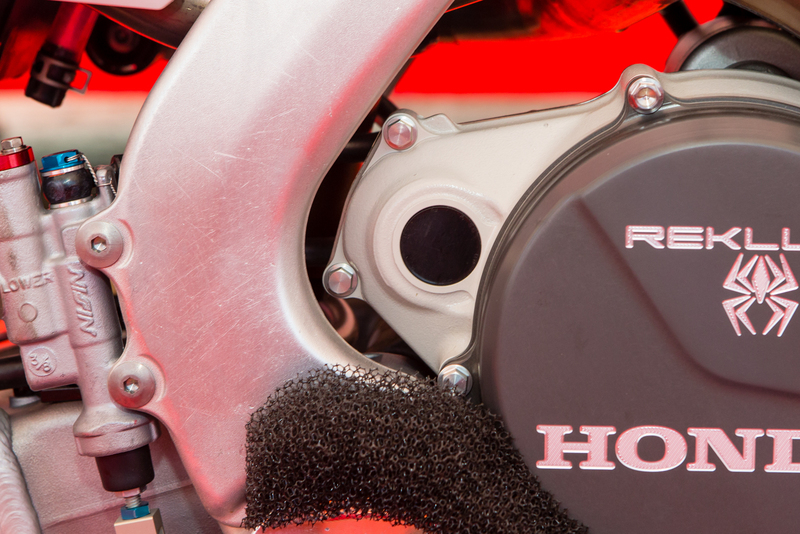 Now for some HRC titanium and carbon fiber goodies. Anyone who has a Honda, has wanted these pegs at some point. 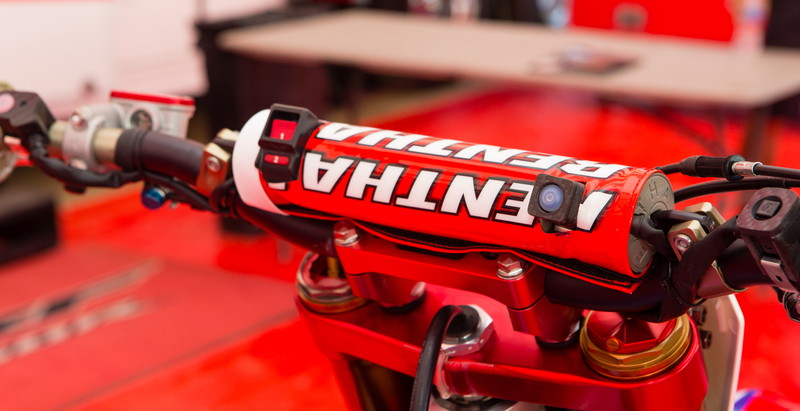 Martin Racing Technologies was the previous home of the HRC Honda MXGP team and is still very involved. 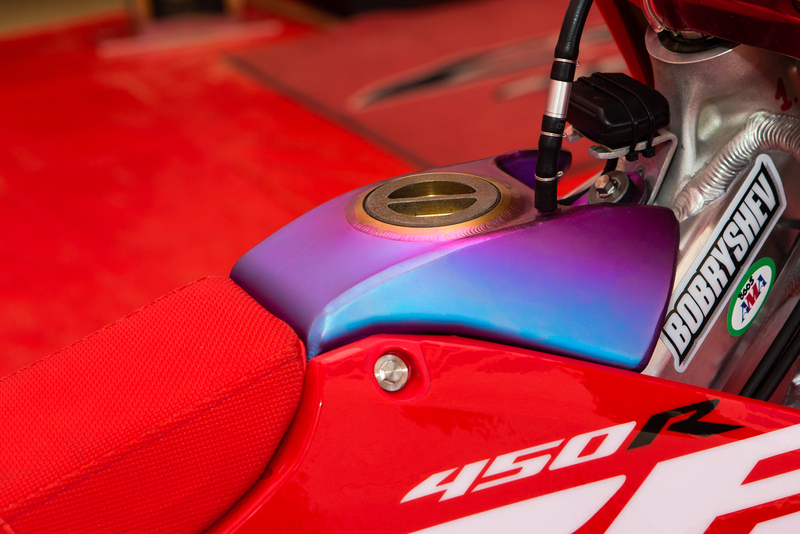 If you've ever wanted the carbon fuel tanks, pegs, hubs, or other parts HRC uses world wide on their motocross bikes, they can be found here: MartinRacingTechnology.com. Remember, where there's money, there's a way! 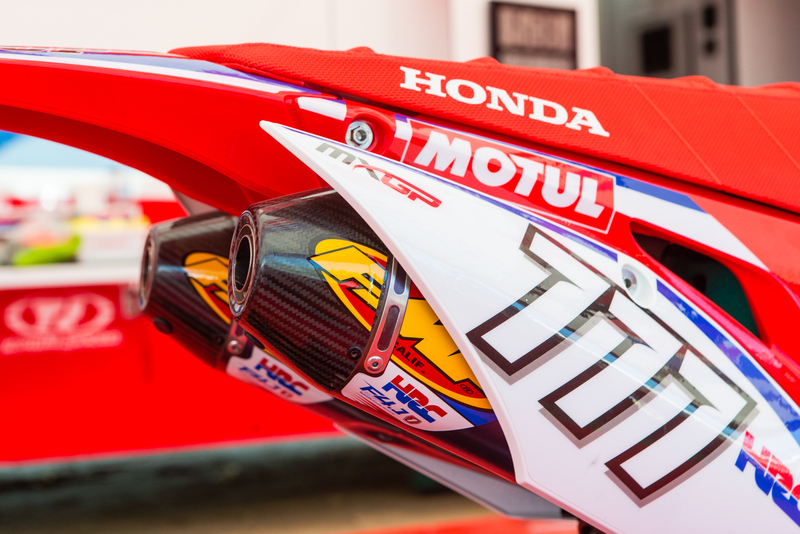 As with most HRC backed efforts, the bikes still retain a very stock inspired look. Even thought they're dripping with unobtanium. I'm a KTM guy but.......WOW! that is sweet! Honda is finally stepping up their game.